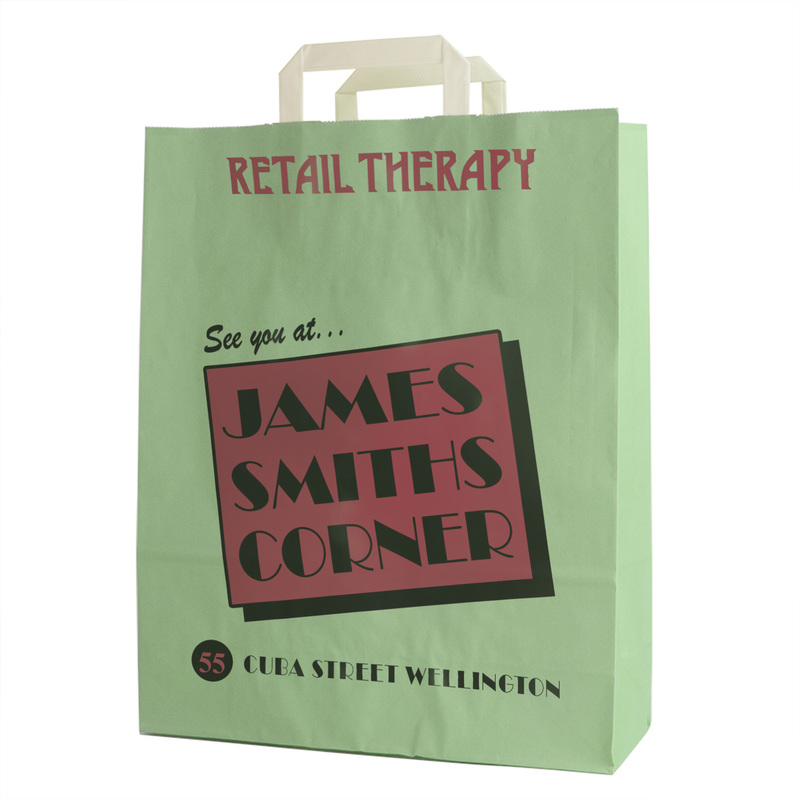 A recreation of a James Smith store shopping bag that was for sale on Trade Me recently. I’ve reconstructed it using a plain paper bag and remade the graphics on to it. With its Deco styling it looks quite old, but in fact- the term “retail therapy” wasn’t created until the 1980s. So here we are back in Wellington. I don’t think we’ve been around since I covered a story on Fuller Fulton a couple of years back. However don’t let that fool you; the place was a hub for all things Longwhitekiddish. Is that not a word? Well, it is now. When I recently covered the story on the Erskine College cache, one of the catalogued items was an old tag from a school uniform garment that had been fitted to measure – and the item had been torn off the article of clothing and discarded down a hole under some loose flooring by the lazy boarder. I was asked for assistance in dating these items and as I looked into each article I naturally investigated James Smith, which was the name printed on it -to see if I would get any clues that would narrow a time frame. Yes, I went off on another tangent. James Smith building, image courtesy of and © Decoworks Pty Ltd. 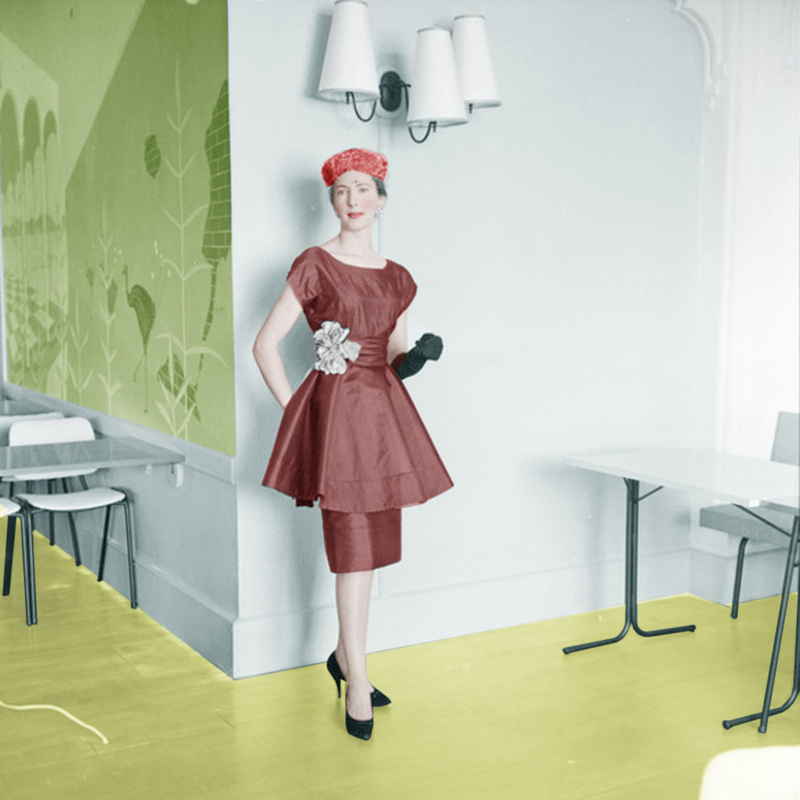 Unidentified woman photographed in the James Smith Tearooms in between modelling at a fashion show, 1959. Negatives of the Evening Post newspaper, Alexander Turnbull Library. Ref: EP/1959/2946-F. Courtesy of the National Library of New Zealand. It turned out to be rather a local institution – dating well back into Victorian times. Such an institution, in fact – that Like Stewart Dawson’s, the business has given its name to the intersection. All windy city locals, if they didn’t know the landmark for the store – know it for the name. In fact to a point that the locale is just referred to as “James Smith Market” or even more simply “James Smith” , and businesses like “Life Pharmacy James Smith”. ” James Smith Basement Cabaret”, and “Starmart James Smith” are named after it. Even the car park just around the corner from the store site at 162 Wakefield Street is named after him. The man’s name lives on, for sure. So who was he? Imported American McCall pattern. 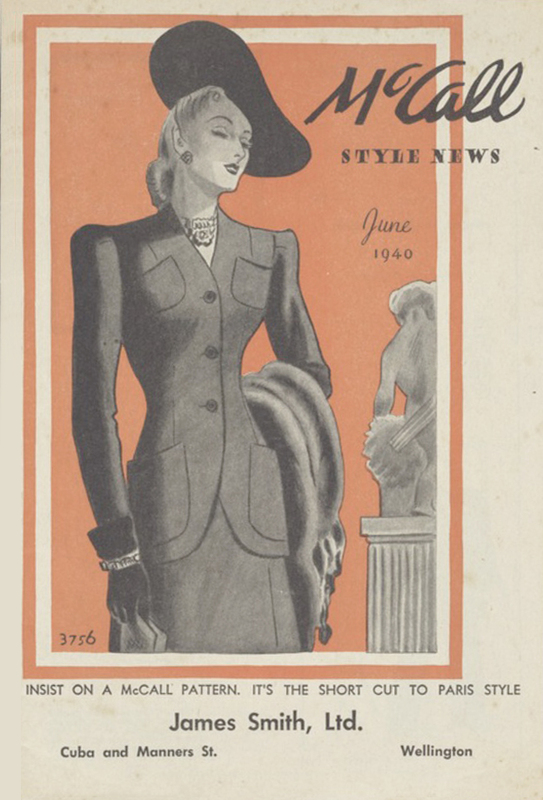 from James Smith, Ltd, 1940. Alexander Turnbull Library, Ref: Eph-B-COSTUME-1940-03-front. Courtesy of the National Library of New Zealand. 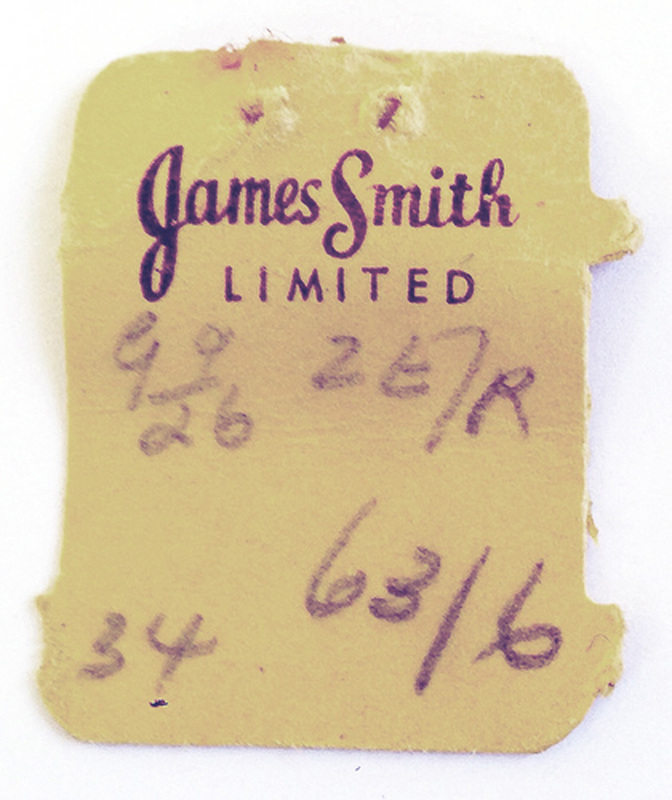 Tag from an altered-to-measure school uniform garment, probably early 1960s, found under the floor of Erskine College. Image courtesy of and © Kylie Walker. James Smith (1834-1902) was one of the area’s earlier settlers, travelling to New Zealand on the Prince of Wales and arriving in June 1863, to Port Chalmers. On the voyage with his wife Annie, he kept a record of the trip, the passengers and goings on. The tooled Moroccan leather-covered book is now in the National Library of New Zealand collection (it was also later issued as a promotional publication by his company in 1967). Keeping an old lady all schmick. Image courtesy of and © Fritz Schöne on Panoramio. 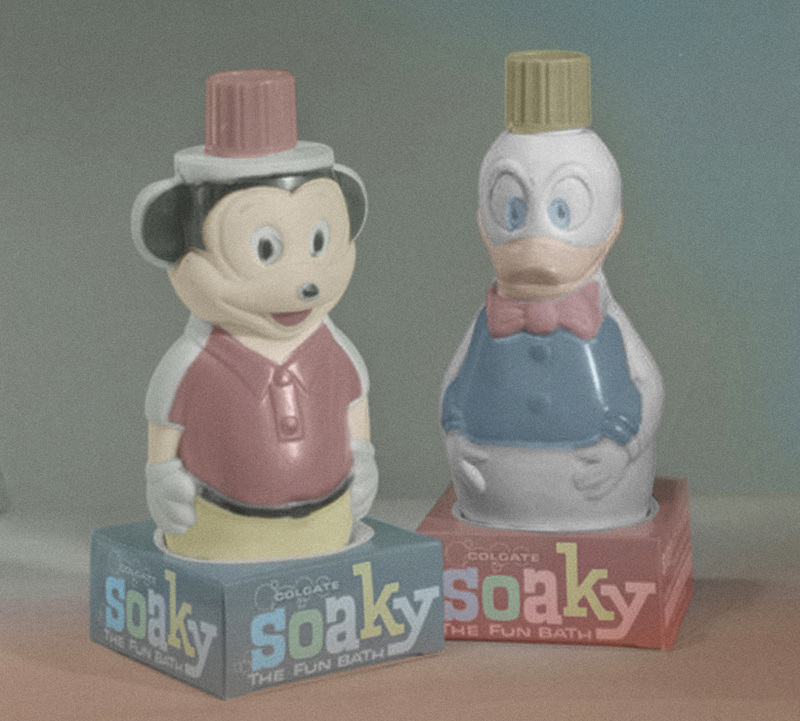 Soaky bubble bath by Colgate. Photographed for James Smiths Ltd promotional material. K E Niven and Co : Commercial negatives. Alexander Turnbull Library, Ref: 1/2-212939-F. Courtesy of the National Library of New Zealand. There was a huge archive of photos pertaining to James Smith Ltd and I had to edit a selection down from hundreds of images to under seventy for this article. He had been born near Edinburgh, Scotland and early in life entered the soft goods trade in the Melrose area, soon proving to be adept and very confident in sales. After some time gaining experience in his home country, he moved on to London where he stayed for five years with drapers James, Shoolbred and Co. Upon arrival in the South Island of Aotearoa he immediately made for Wellington, where he found employment with the wholesale firm of W. and G. Turnbull and Co., quickly rising to management of their drapery department. He stayed in this position for three years, then he purchased and established his business in 1866. Beginning on his own he quickly became very successful. 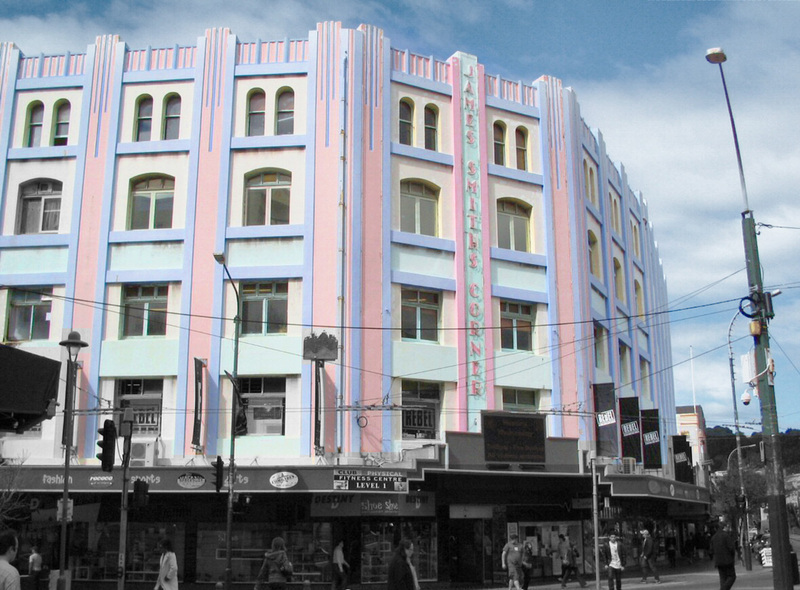 The department store was ensconced in Te Aro House, 84-92 Cuba Street, Wellington – which had previously operated as Mary Taylor’s Drapery. The James Smith Xmas Parade: All images Negatives of the Evening Post from the Alexander Turnbull Library collection, Courtesy of the National Library of New Zealand. Clockwise from top left: Refs: EP/1958/4005-F, EP/1958/3999-F, EP/1958/4008-F, and EP/1958/4000-F.
James Smith’s store Te Aro House, 1866-1898. Apparently the building still stands and is now known as the Deka building, and hosts a Rodney Wayne hair salon amongst others. Image courtesy of ngairedith on Family Tree Circles. In 1877 he started an additional business, when he became partners with one of his previous employers, Walter Turnbull. Turnbull Smith & Co., operated from Customhouse Quay until 1888 when it was acquired by Sargood, Son and Kwen. 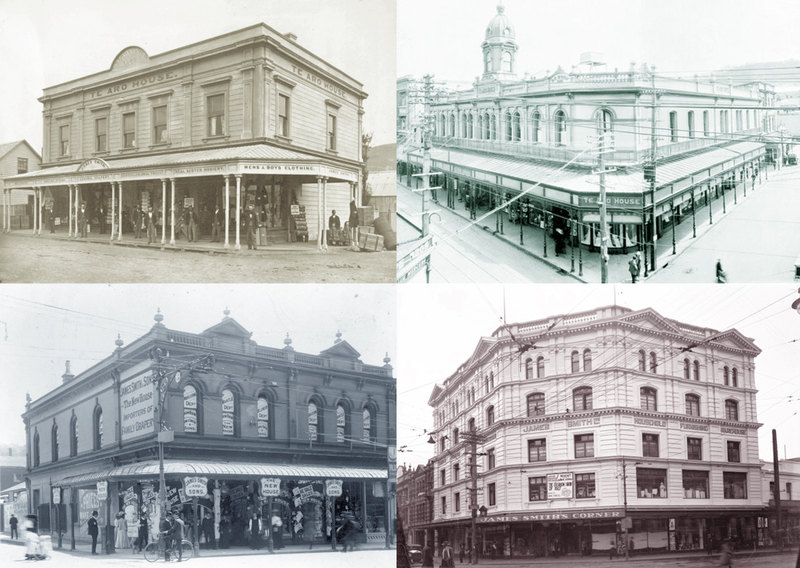 He rebuilt a new store on the Te Aro House site in 1886, designed by Thomas Turnbull. This was likely spurred by a fire in the building of 1885. He remained here in the new premises (diversifying from fabric into menswear, boyswear, and hosiery) through to 1898 when his business suffered financial collapse. L: James Smith’s Diary, kept on his voyage to New Zealand 1863. It was later republished by the business in the 1960s. Ref: MSX-3502. R: James Smith (on left) with his staff, Te Aro House in the late 1870s.Ref: PAColl-3332-11-3. Both images from the Alexander Turnbull Library collection, Courtesy of the National Library of New Zealand. 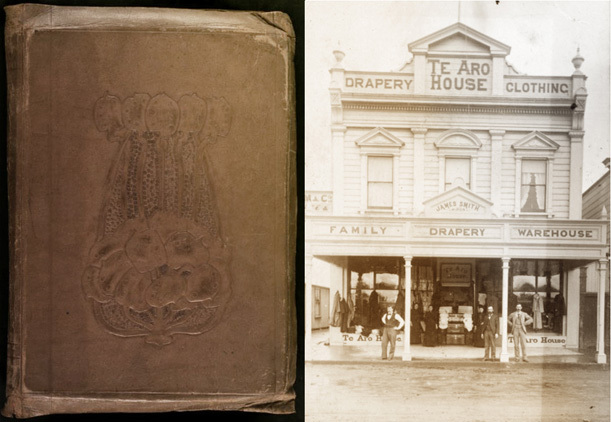 Clockwise from top left: James Smith and staff at Te Aro House, 1880, Ref: PAColl-3332-17-2. Te Aro House, in 1924 after the Smiths were no longer associated with it, Ref: 1/1-038758-F. The New House (James Smith & Sons), 1900, Ref: PAColl-3332-17-1. James Smith Store before 1932, Ref: EP-0585-1F/2-G. All images from the Alexander Turnbull Library collection, courtesy of the National Library of New Zealand. 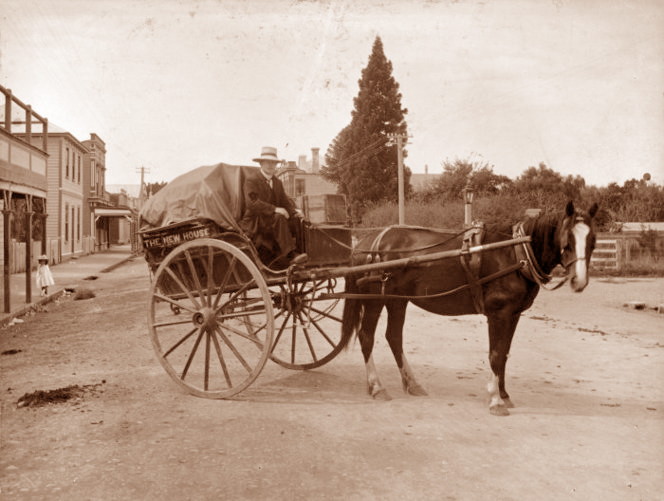 Cart from James Smith & Sons’ “The New House” on Cuba and Dixon Streets, Wellington, circa 1902. Ref: PAColl-3332-11-1. Image from the Alexander Turnbull Library collection, courtesy of the National Library of New Zealand. 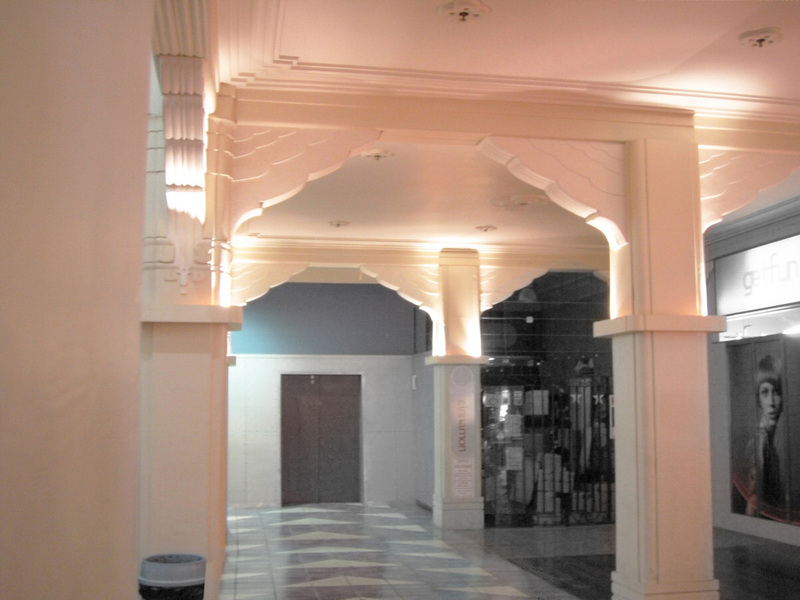 The foyer of the James Smith department store building in 2009. Image courtesy of and © Decoworks Pty Ltd.
James Smith had by accounts been in ill health for some time when he died at his Wellington home, and had stepped back from the business just after The New House had opened. Management then passed to one of the two sons Alexander Pringle Smith (1873-1948). The other offspring involved in running the business was J. G. Smith – and there were also five daughters from the union. However James continued to advise both of them in business matters until just a couple of weeks before he passed away. Upon his demise the business was described as “the largest drapery establishment in the North Island”, and he as a “most enterprising, popular and progressive colonist.” By this time he was wealthy and influential – being one of the original shareholders and one of the chairmen of the Wellington and Manawatu Railway Company and a member of the New Zealand Board of Directors of the National Mutual Life Association of Australasia. The Justice Department hold a record of a coronial inquest into James’ death but what the reasons were behind this inquiry, I don’t know. He was interred in Kaori Cemetery. 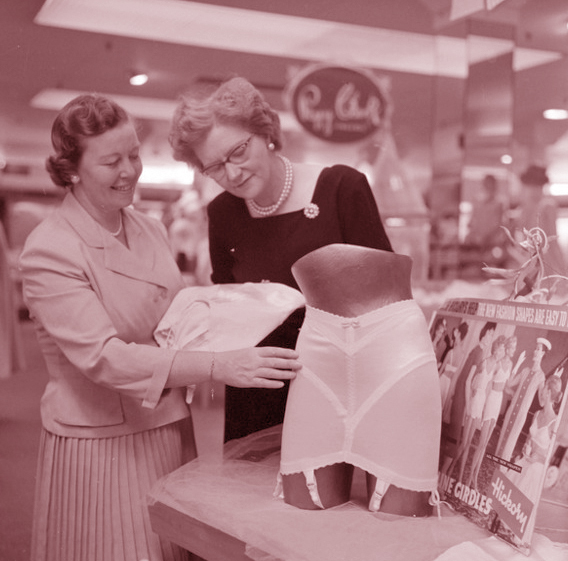 Miss Mollie Massey and colleague at James Smith store Ladies’ Undergarments department, 1959. Ref: EP/1959/0516-F. Image from the Alexander Turnbull Library collection, courtesy of the National Library of New Zealand. 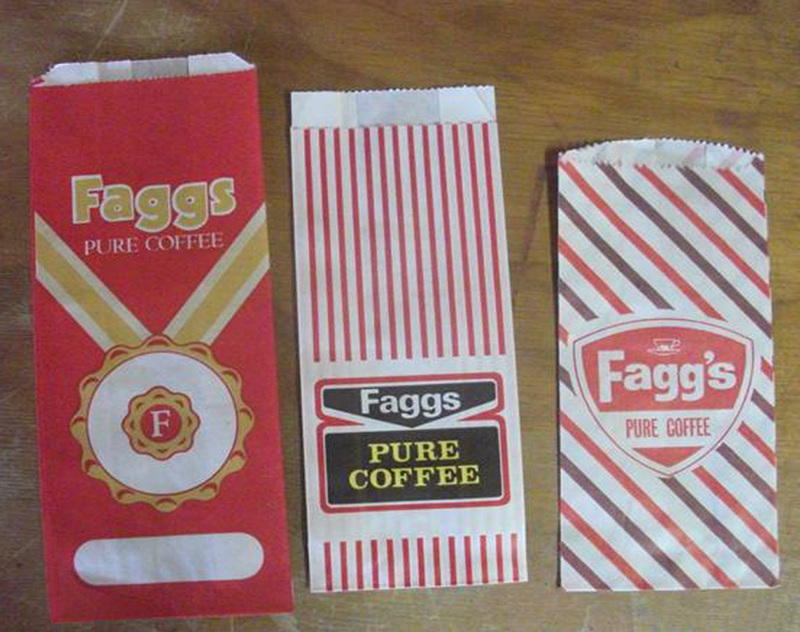 Local brand Fagg’s coffee, established in Wellington in 1926, were behind the coffee bars and lounges in all of the James Smith departments stores. These bags are possibly from the 1970s. 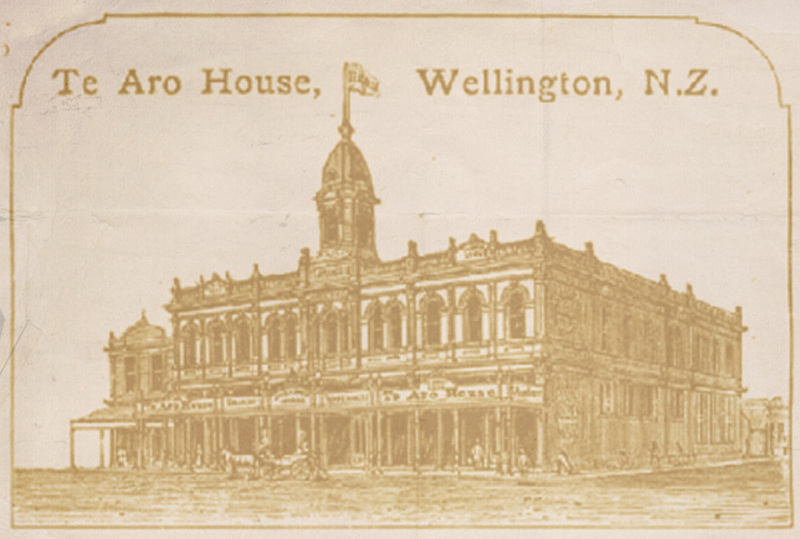 The final and grandest building, which the business was to remain in for more than 85 years, was on the corner of Cuba and Manners Streets in the Te Aro area of Wellington – at 49-55 Cuba Street to be precise. It had originally been constructed for ironmonger and importer George Winder In 1907 by architects Penty and Blake. He had owned the land since 1898 and ergo, it was known as “Winders’ Building “. His business “like many others, had deteriorated due to his inability to obtain stocks from overseas due to the dearth of shipping caused by the First World War”, according to Don Ratcliffe, who worked as a message boy through 1921 and recalls the work of the move from one premises to another in detail, when James Smith and Sons purchased it in 1921. In 1932 the entire building was revamped to its current look by King and Dawson, with interior murals by Ruffo and Steve Templer – making it into an iconic landmark of the downtown area. The Whitcombe & Tombs book department at James Smith, K E Niven and Co : Commercial negatives. Alexander Turnbull Library, Ref: 1/2-210236-F. Courtesy of the National Library of New Zealand. 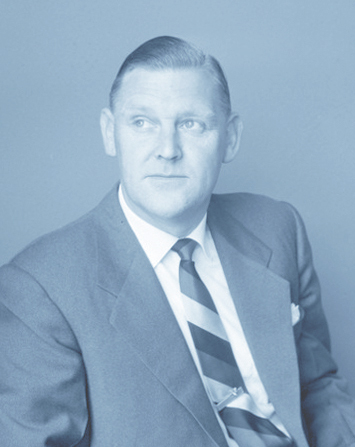 Mr Doug Smith, James Smith’s grandson, eventually became the managing director in the 1950s. This portrait taken 1956, Negatives of the Evening Post newspaper, Alexander Turnbull Library, Ref: 1/2-210236-F. Courtesy of the National Library of New Zealand. By this time directorship had passed to subsequent Smith descendants – Alexander Pringle Smith ‘s sons Howard Williams Smith (1912-1993), and his sibling J.G. Smith Jr. Eventually by the late 1950s it was in the control of grandson Douglas Alexander Smith – and from then on A.P. Smith was only occasionally seen pottering about the halls. 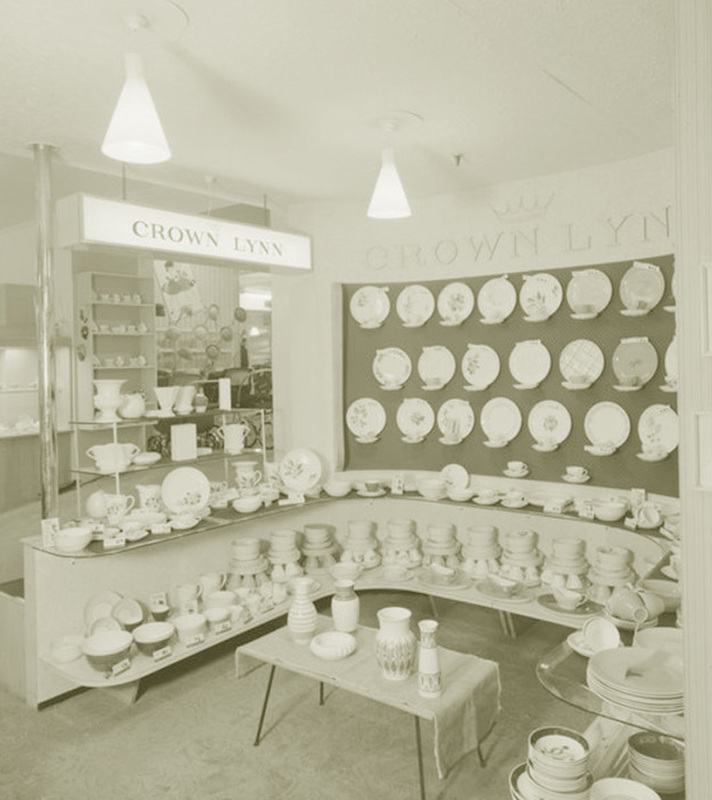 Crown Lynn section at James Smith store, 1962. K E Niven and Co : Commercial negatives, Alexander Turnbull Library, Ref: 1/2-213392-F. Courtesy of the National Library of New Zealand. 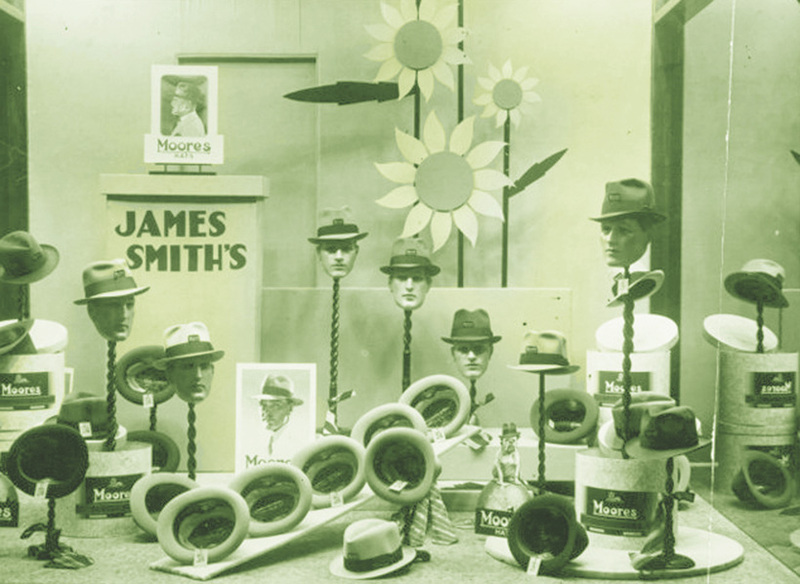 James Smith Ltd. window display of Moore’s hats for men, 1939. Alexander Turnbull Library, Ref: PAColl-3332-03-34. Courtesy of the National Library of New Zealand. 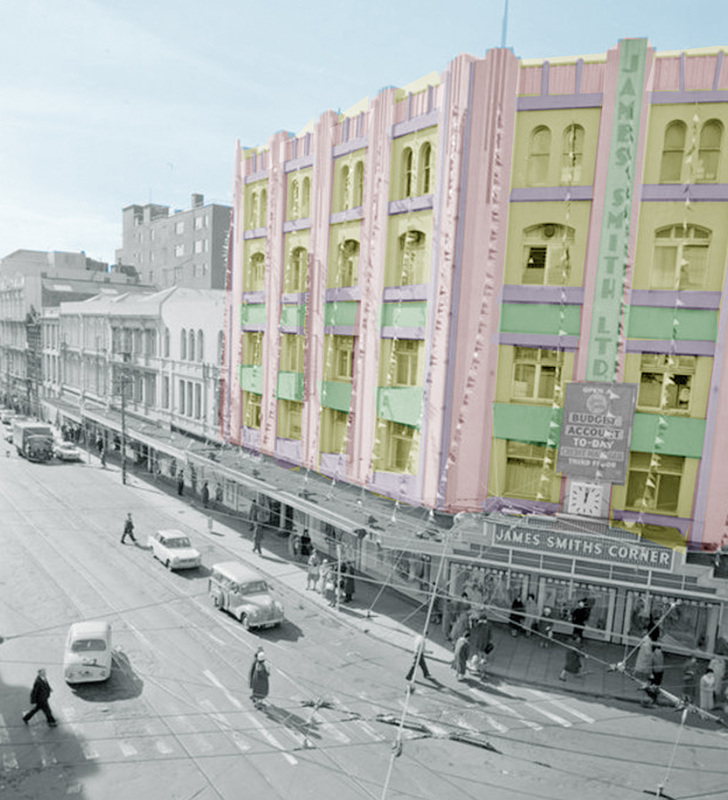 An addition was built in 1934 down the Manners Street side, and two additions along the Cuba Street side in the 1960s. Cuba Street was always the flagship store. 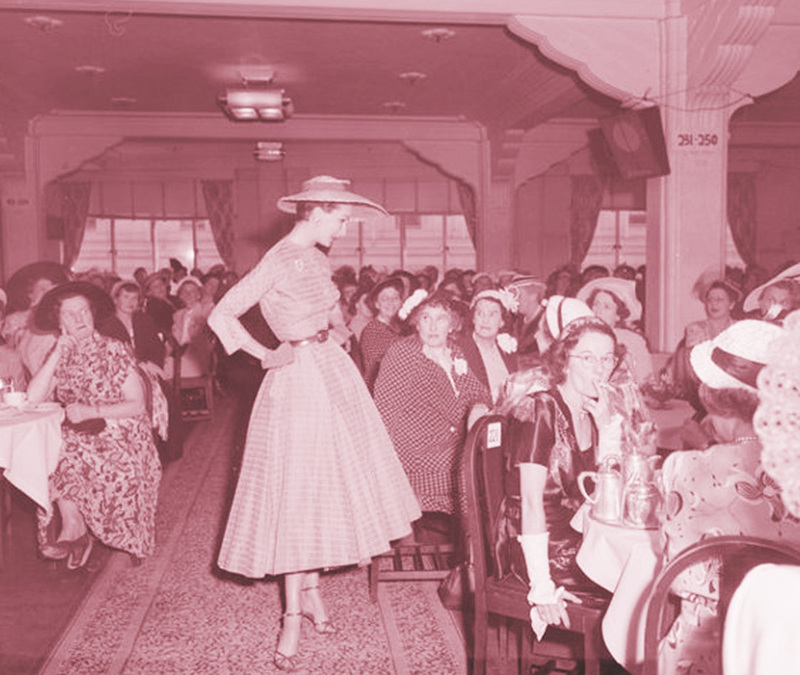 No doubt it had all the fairly standard departments – but those specifically recalled as far back as the 1950s were: Fashion, Shoes, Juvenile clothing, Corsetry, Hosiery, and Kitchenware. The Millinery area was on the first floor. 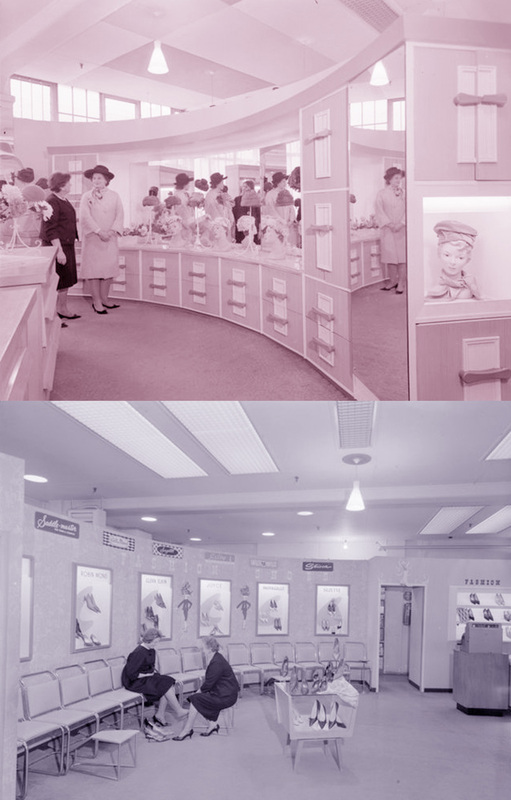 In the 1960s employees recall departments for Cosmetics, Jewellery, a record bar, Watches, Haberdashery, Knitwear, Swimwear, Toys and Stationery, Novelties, Home Services (appliances) and Books. There was also an in-house hairdresser’s to cater to those ladies who lunch (and also those that didn’t) in more formal times, when you got your bonce baked and lacquered to an almost indestructible finish at least once a week. 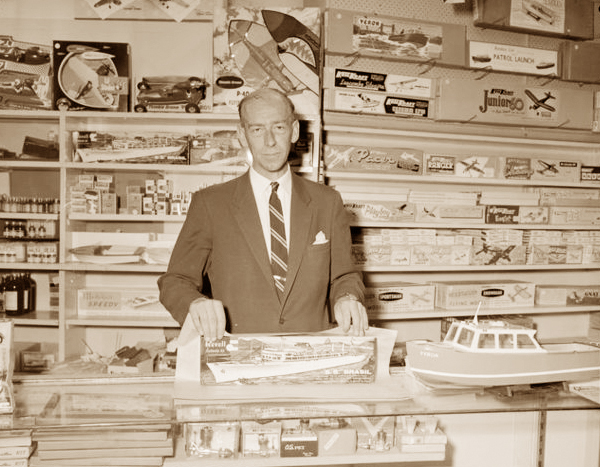 Salesman at counter of the James Smith Model Ships and Toys Department, 1961. Alexander Turnbull Library, NLNZ Ref 12-212697-F. Courtesy of the National Library of New Zealand. 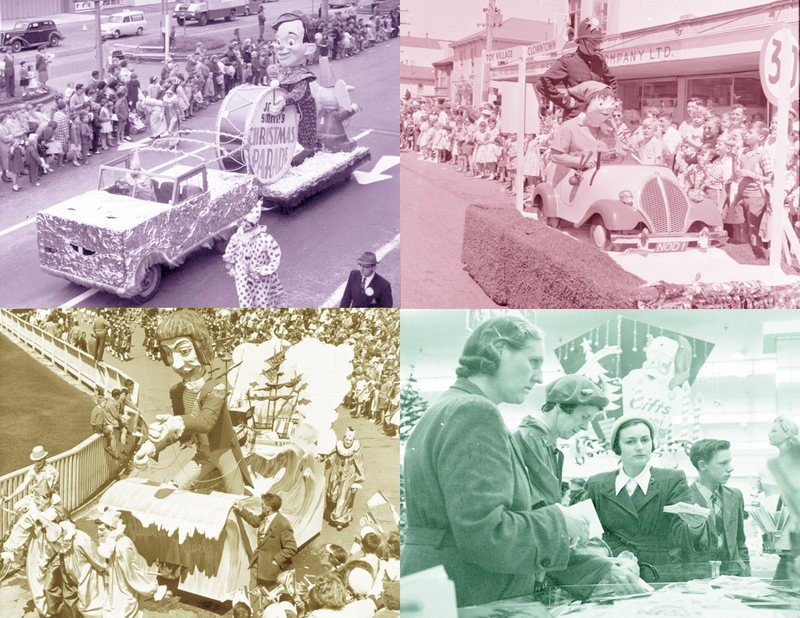 The James Smith Xmas Parade: Clockwise from top left: Kent or Cambridge Terrace by K E Niven Ltd, 1962-1968, Ref: PAColl-3332-05-08. Noddy float, Negatives of the Evening Post, 1958 Ref: EP/1958/4007-F. Shopping for Christmas cards 1955, Negatives of the Evening Post, Ref: EP/1955/2797-F. Gulliver float by K E Niven Ltd, 1962-1968, Ref: PAColl-3332-05-07. All images from the Alexander Turnbull Library collection, courtesy of the National Library of New Zealand. 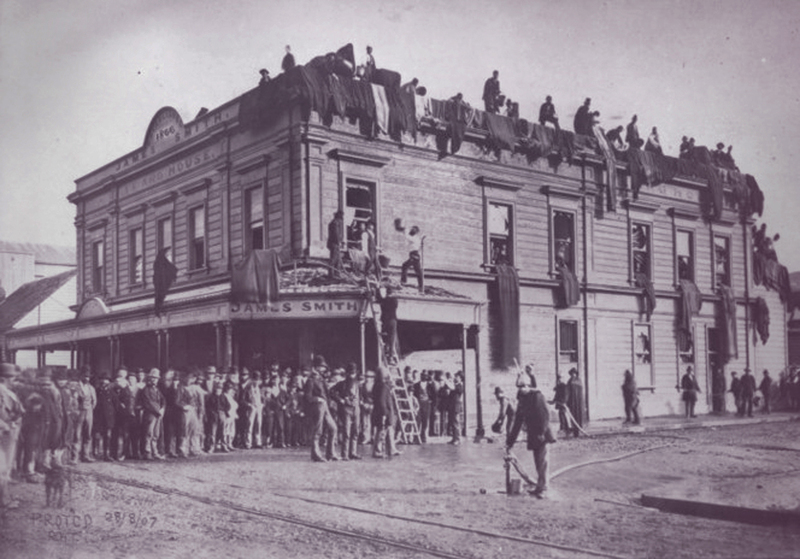 Staff busy hanging lengths of fabric from the windows and roof to dry out after the fire at Te Aro House of 18 April 1885. Alexander Turnbull Library collection, Ref: PAColl-3332-1-3. Courtesy of the National Library of New Zealand. 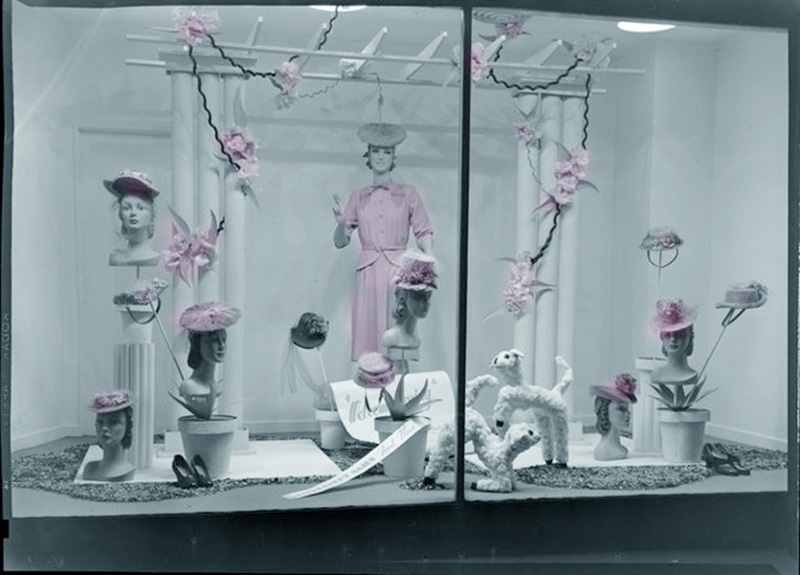 James Smith Ltd Window Display for women’s hats, taken by Thomas Hugh Tingay, 1940, Alexander Turnbull Library collection, Ref: PAColl-3332-03-37. Courtesy of the National Library of New Zealand. 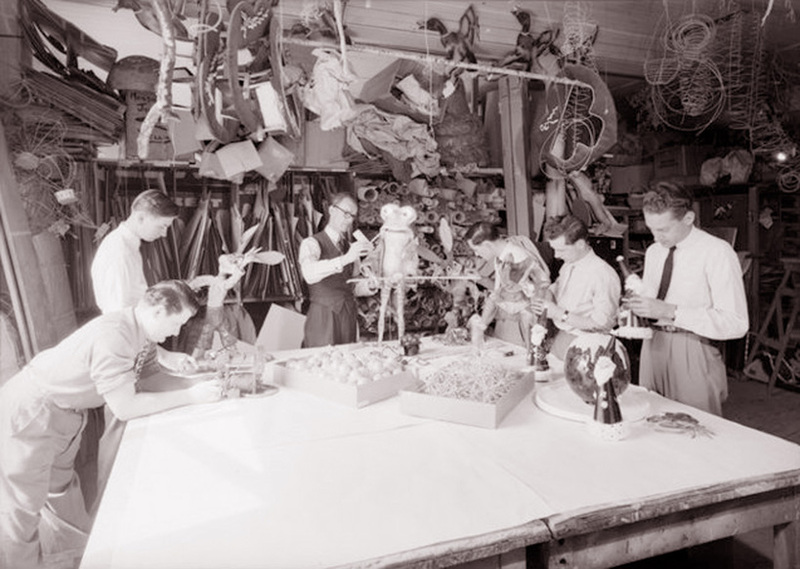 There was an Advertising department as well as a design studio and workshop for the enormous amount of labour-intensive window decorating that came with the territory. One of the perks of changing over the displays was “entertaining all of the drag queens from in the windows”, remembers one designer of the 1970s. I suppose they may be referring to customers to-ing and fro-ing from the infamous “Carmen’s International Coffee Lounge” not far away, as well as the notorious “ladies” of the night that frequented the local area plying their trade. 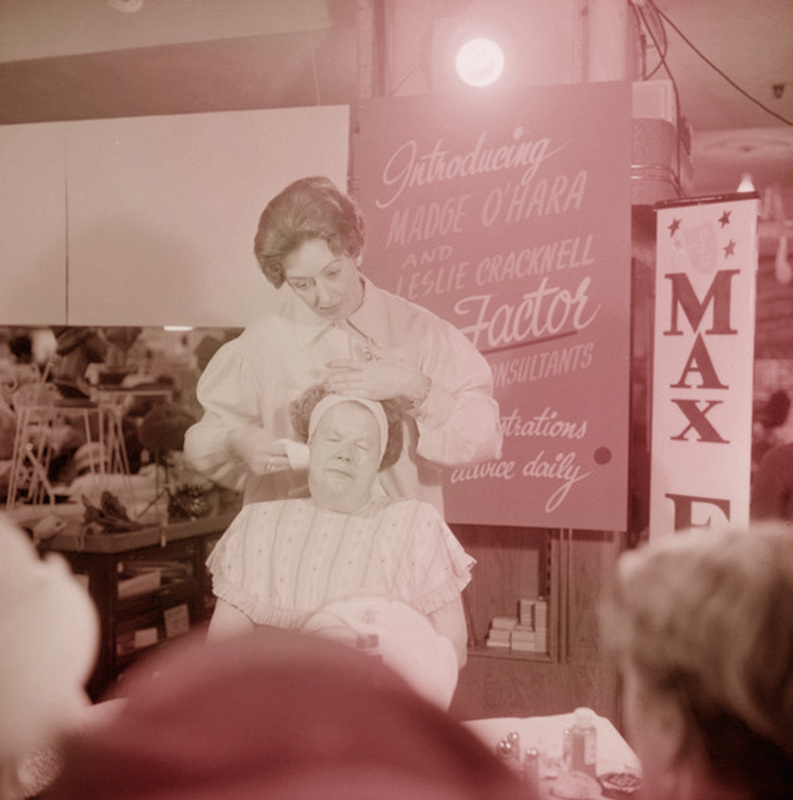 Demonstration of facial care with Max Factor products, 1960. Negatives of the Evening Post, Alexander Turnbull Library collection, Ref: EP/1960/1508-F. Courtesy of the National Library of New Zealand. 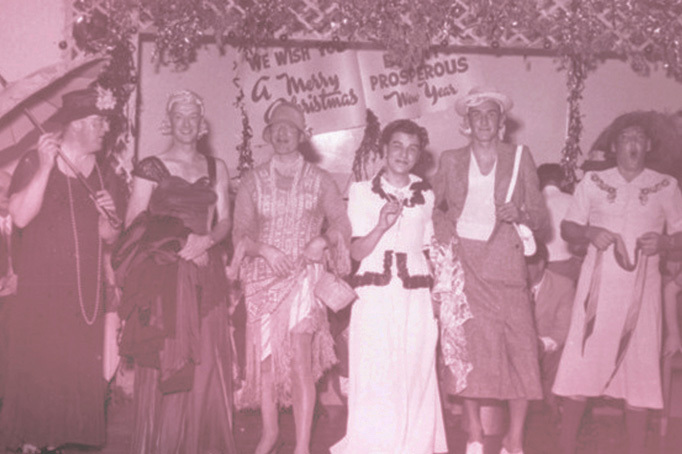 Male staff in drag, putting on a comedic fashion show at a James Smith Ltd staff Christmas party in 1953. Alexander Turnbull Library collection, Ref: PAColl-3332-3-1. Courtesy of the National Library of New Zealand. Underlining the idea touched upon in the Fuller Fulton article that Cuba Street and surrounds was a hotbed of bohemia – a coffee bar was introduced with a machine serving espresso – customers could order cappuccinos, as well as more standard cafe/milk bar fare of the era like Spiders. Jean Kahui, who worked there, remembers this was quite innovative for the time , even into the following decade. 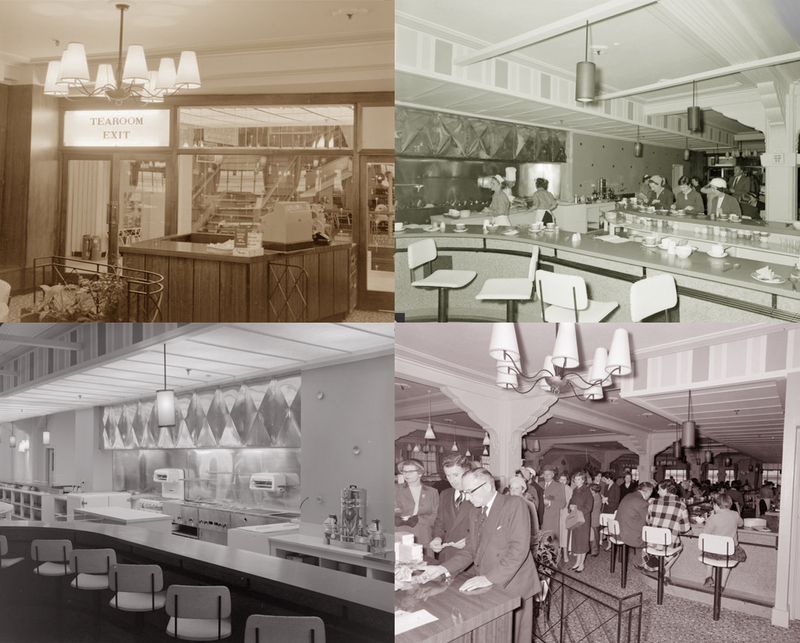 The coffee bars – if not straight away, then certainly by the next decade were operated by Fagg’s – a local Wellington brand (established 1926) that later went national and is still going today. James Smith’s Corner in 1962, by K E Niven Ltd. Alexander Turnbull Library collection, Ref: 1/2-213413-F. Courtesy of the National Library of New Zealand. 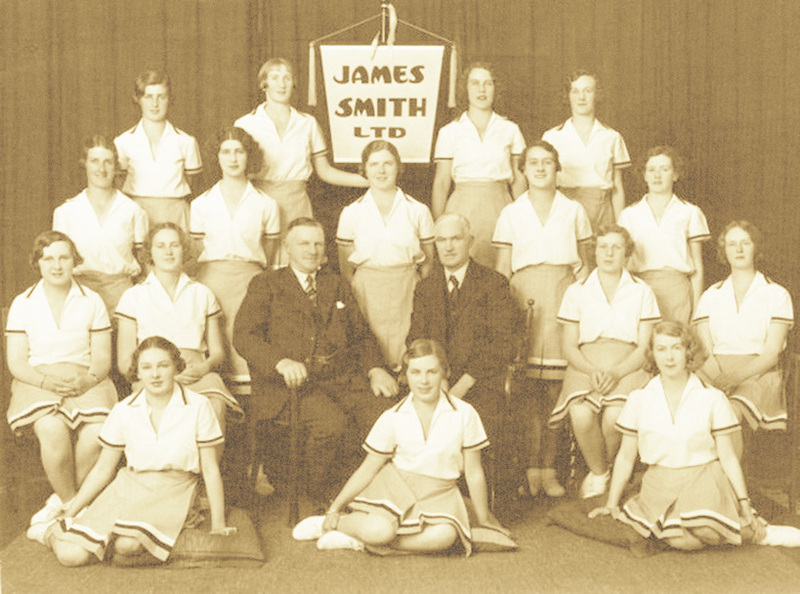 The James Smith Ltd Women’s marching team, 1930, with managers A.P. and J.G. Smith. Alexander Turnbull Library collection, Ref: PAColl-3332-01-01. Courtesy of the National Library of New Zealand. 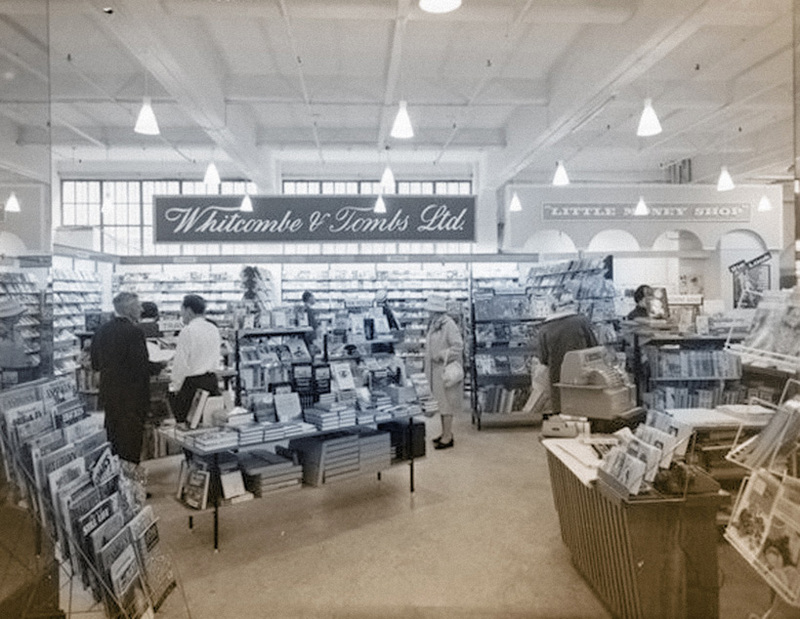 Brands carried by the store in the 1960s included Canterbury clothing, Crown Lynn china, Farren-Price watches, and Whitcombe and Tombs books. 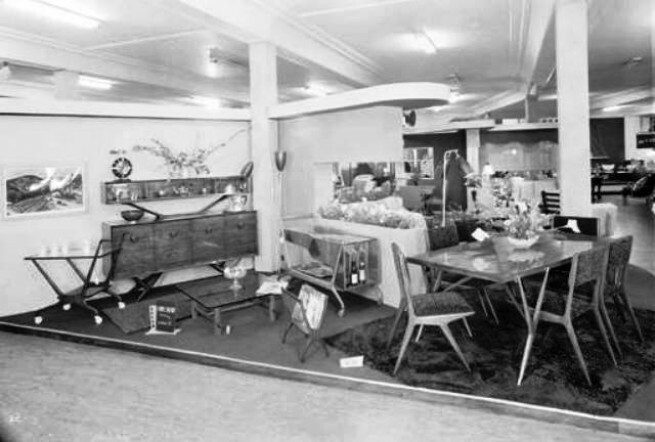 The two level Porirua store with a large car park launched to much fanfare in 1964 and included a cafeteria. Eventually the department store had branches in Upper Hutt and Lambton Quay too, which also had a delicatessen. 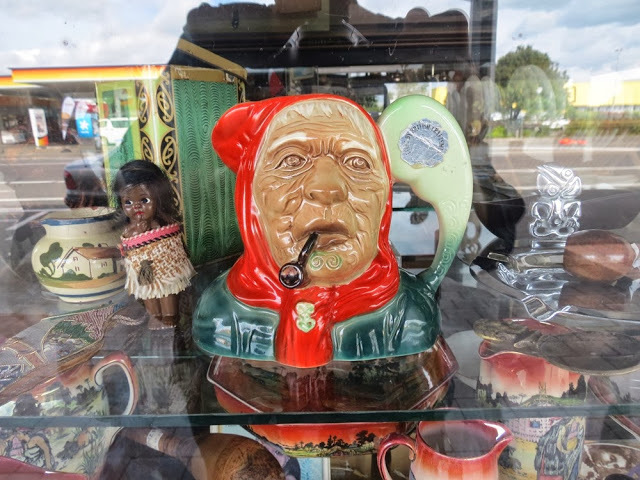 By the 1970s there was also a store in Johnsonville. There was also a Sports Depot in Willis St (formerly Witcombe & Caldwell, acquired by James Smith sometimes after the early 1960s). 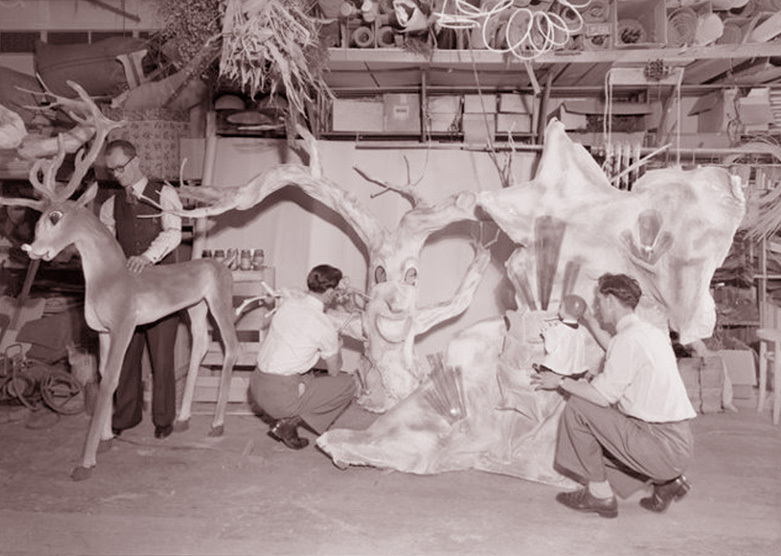 James Smith Ltd display department at work on floats for the Xmas parade of 1958. Negatives of the Evening Post, Alexander Turnbull Library collection, Ref: EP/1958/3939-F. Courtesy of the National Library of New Zealand. 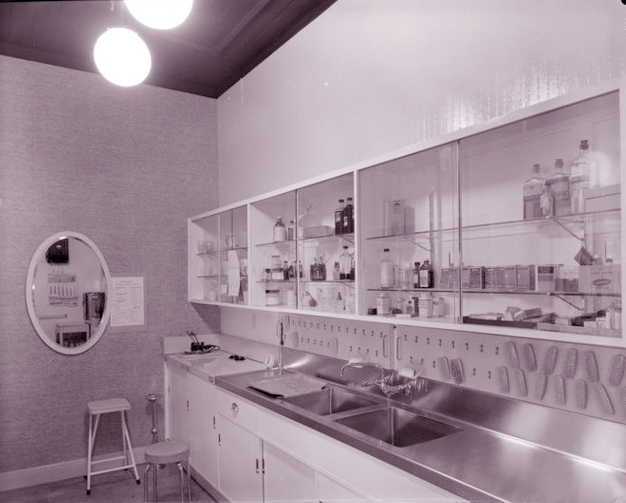 James Smith department store Hairdressing Department and Beauty Salon, by K E Niven Ltd, Alexander Turnbull Library collection, Ref: 1/2-211677-F. Courtesy of the National Library of New Zealand. Into the 1970s the main store had a Pattern dept on the second floor, Men’s Suits, Men’s Ready to Wear, Boyswear, Girl’s School, Young Fashion, and Ladies Fashion and Sportswear (the Miss Wellington line had its own section). There was Men’s and Ladies’ Shoes, Sports and Sportswear, Home Appliances, Knitwear/Swimwear, Dress Fabrics, Soft Furnishings, Corsetry, China and Glassware. Model in a fashion show for “outsize women”, 1950. Negatives of the Evening Post, Alexander Turnbull Library collection, Ref: 114/204/04-G. Courtesy of the National Library of New Zealand. 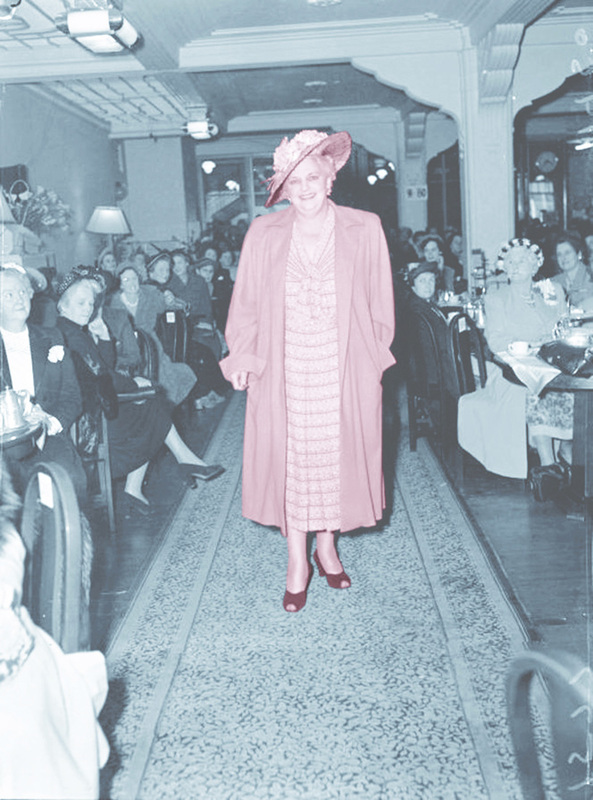 Barbara Goalen modelling in a fashion show held in the James Smith tearooms,by K E Niven Ltd, Alexander Turnbull Library collection, Ref: 1/2-210005-F. Courtesy of the National Library of New Zealand. One dresser recalls an amusing story of knocking over the large display China Bull from Hereford, “breaking off its crown jewels”, as well as “having cabbages thrown at us by Hudson & Halls, yet again at the expense of the department buyer”(I don’t quite understand why this happened or what it was about, unless the couple of TV cooks had some kind of product that needed to be merchandised). There was Greeting Cards/Stationery, Costume Jewellery, and a coffee lounge. Cosmetics now included the swinging Mary Quant brand straight from Carnaby Street. 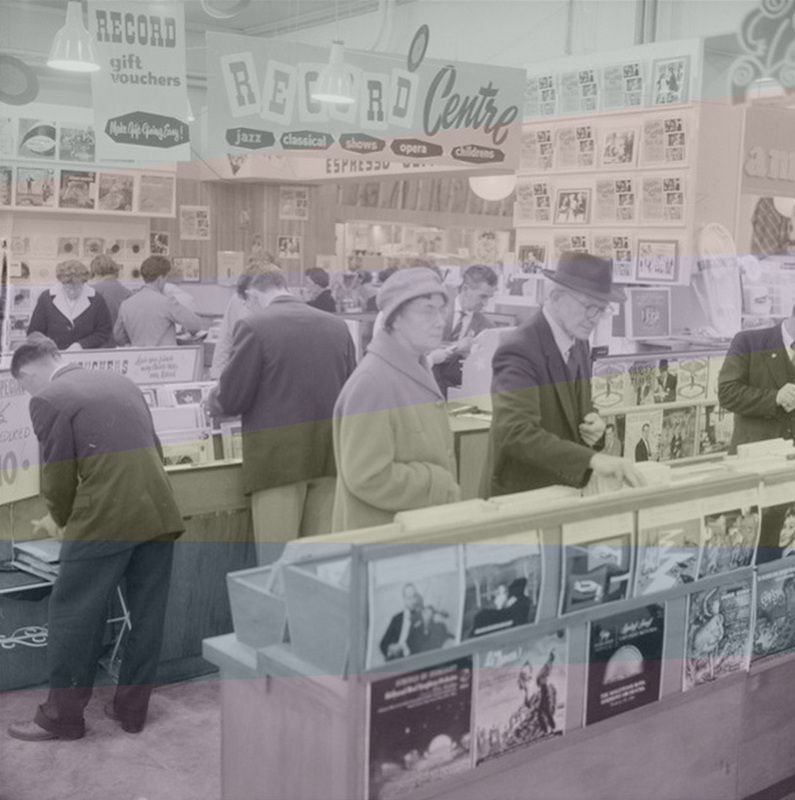 Shopping in the Record Department, 1960. Negatives of the Evening Post, Alexander Turnbull Library collection, Ref: EP/1960/1515-F. Courtesy of the National Library of New Zealand. 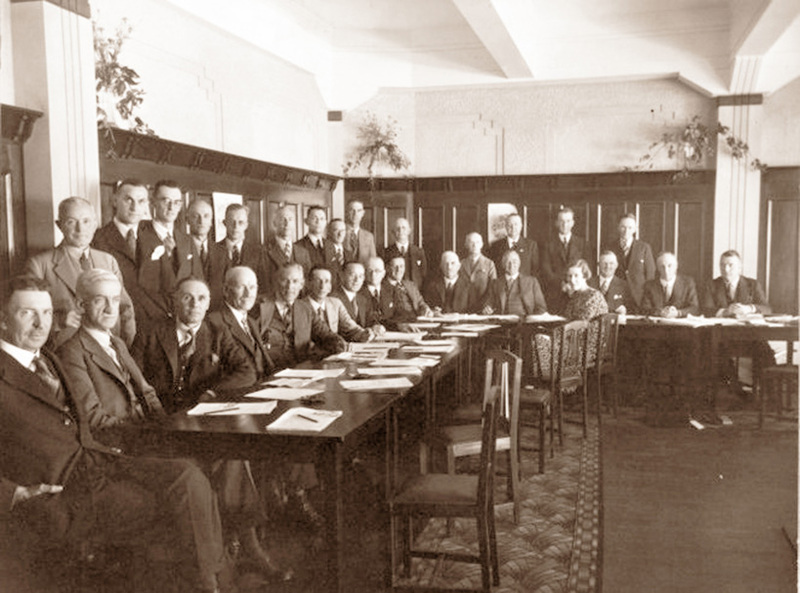 All the menfolk and just one gal: Meeting of James Smith Ltd male staff members, 1933. Alexander Turnbull Library collection, Ref: PAColl-3332-15-3. Courtesy of the National Library of New Zealand. The 1980s saw Lingerie, Childrenswear, Babywear, Handbags, Accessories, and Whitegoods departments as well as “Young World”( probably Tweens), and a beauty salon. Salesgirls at the makeup counters spruiked Shiseido, Clarins, and Estee Lauder. Behind the scenes was an executive suite, and the offices known as “the goldfish bowl”, for the typing pool and operators running the switchboard. Christine Lamberton remembers “I was the telephonist, working on the old plug and cord- type switch. Many a time I put toll calls through and then had to page the buyer who put in the request!” There was also marking off, credit control , and computing departments. 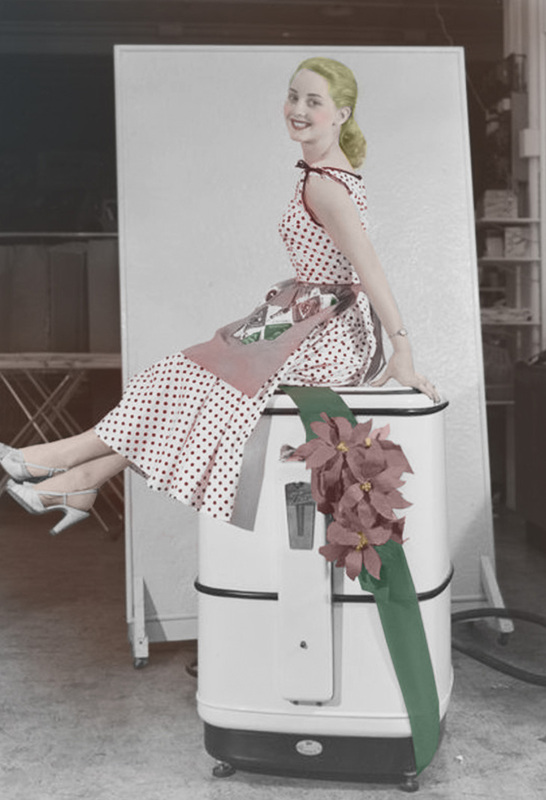 Housewife on a washing machine, photographed for James Smiths Ltd promotional material. K E Niven and Co : Commercial negatives. Alexander Turnbull Library collection, Ref: 1/2-215299-F. Courtesy of the National Library of New Zealand. 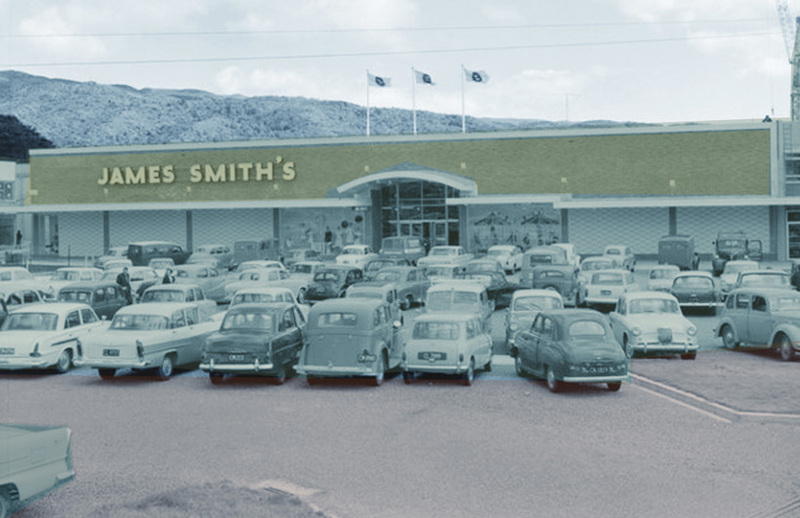 The new James Smith Ltd Porirua store in 1964. K E Niven and Co : Commercial negatives. 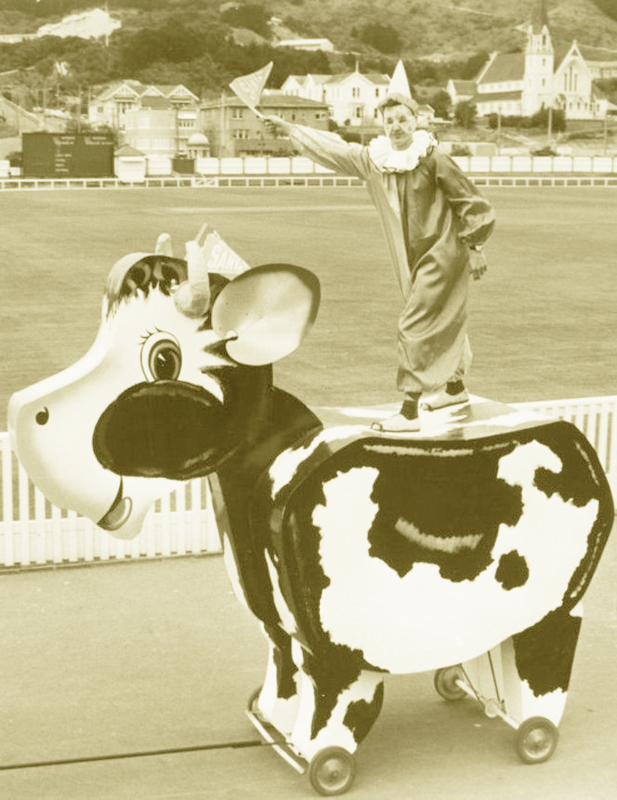 Alexander Turnbull Library collection, courtesy of the National Library of New Zealand. It makes me lament the times gone by that stores had specific departments just for what seems strange and obscure things now – but were in the era quite an everyday thing if one wanted to “keep up standards.” So many of those rituals have fallen by the wayside in just a couple of decades. Who sends greeting cards these days, let alone devotes a department to stationery? And, with the amount of unbecoming muffin tops I see spilling out of hipsters these days – some corsetry wouldn’t actually go astray. Secretary taking shorthand in the executive suite, K E Niven and Co : Commercial negatives. Alexander Turnbull Library collection, Ref: 1/2-214625-F. Courtesy of the National Library of New Zealand. 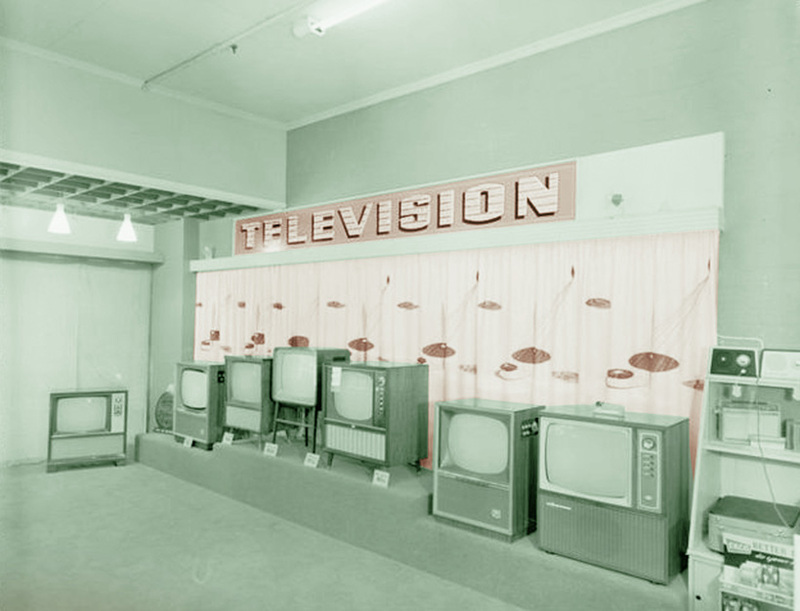 The TV Department of James Smith’s in 1961, K E Niven and Co : Commercial negatives. Alexander Turnbull Library collection, Ref: 1/2-213170-F. Courtesy of the National Library of New Zealand. James Smith Ltd workers with a lorry load of My Fair Lady records, 1958. Negatives of the Evening Post, Alexander Turnbull Library collection, Ref: EP/1958/4262-F. Courtesy of the National Library of New Zealand. 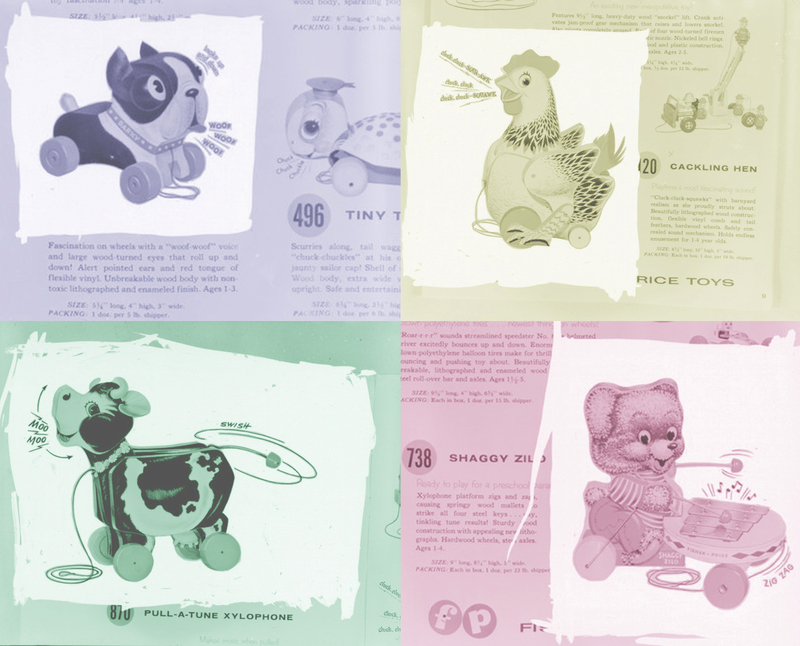 Musical Fisher-Price pull toys, 1960, photographed for James Smiths Ltd promotional material. K E Niven and Co : Commercial negatives. Alexander Turnbull Library collection, all images courtesy of the National Library of New Zealand. Refs Clockwise from top left: 1/2-212236-F, Ref: 1/2-212232-F, Ref: 1/2-212235-F, and Ref: 1/2-212231-F. Sometime between 1982 and 1987 the business was sold to L. D. Nathan, now Australia-based behemoth Lion Nathan. Probably resulting from a redundancy agreement made with a portion of employees, around this period came a mess of legal issues – Administrative & Related Workers Industrial Union versus James Smith Limited (Dispute of Right) in 1982, New Zealand Shop Employees Union versus James Smith Limited (Dispute of Right , personal grievance of Miss E. Orr) in 1983, and Shop Employees versus James Smith Limited (personal grievances) in 1985. 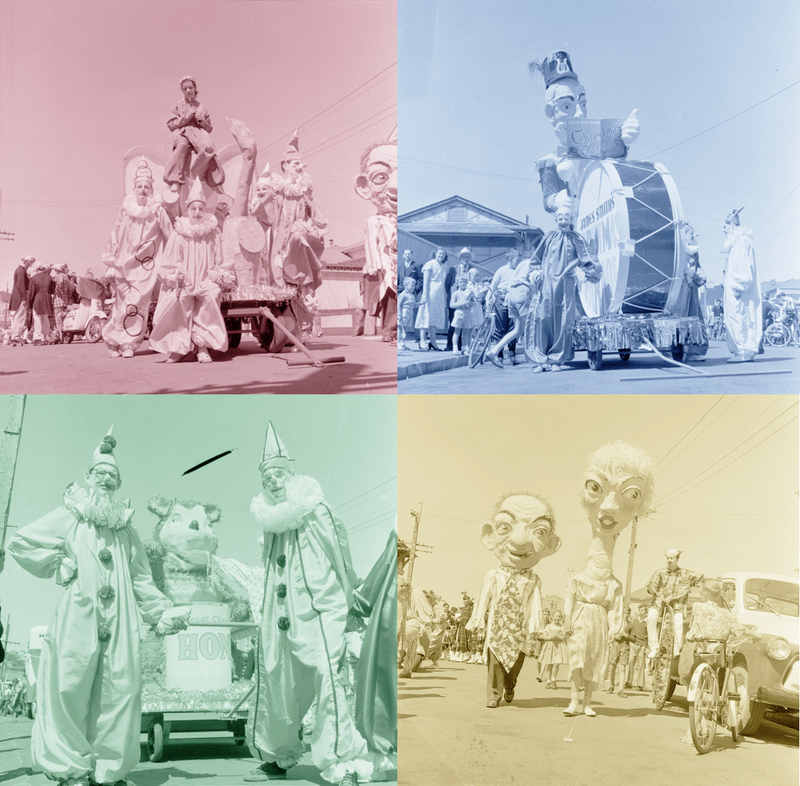 The James Smith Xmas Parade, by K E Niven Ltd, 1963-1968. Alexander Turnbull Library collection, Ref: PAColl-3332-05-05, courtesy of the National Library of New Zealand. The display department at James Smith Ltd. In three years and over 100 articles I’ve never had a personal family connection to a story yet. In an interesting incident, three days after I had written the story, a relative told me that my first cousin, whom I never got to meet, had worked at James Smith doing display, and I immediately showed this set of images to see if he was possibly one of the men. I was blown away to find that he is, and that’s Michael Begelman crouching on the right. Image by K E Niven Ltd, 1950s, Alexander Turnbull Library collection, Ref: 1/2-209977-F. Courtesy of the National Library of New Zealand. Further to that James Smith Limited along with Woolworths and McKenzie’s was tangled up in a court case with the planning/environmental tribunal in 1987. 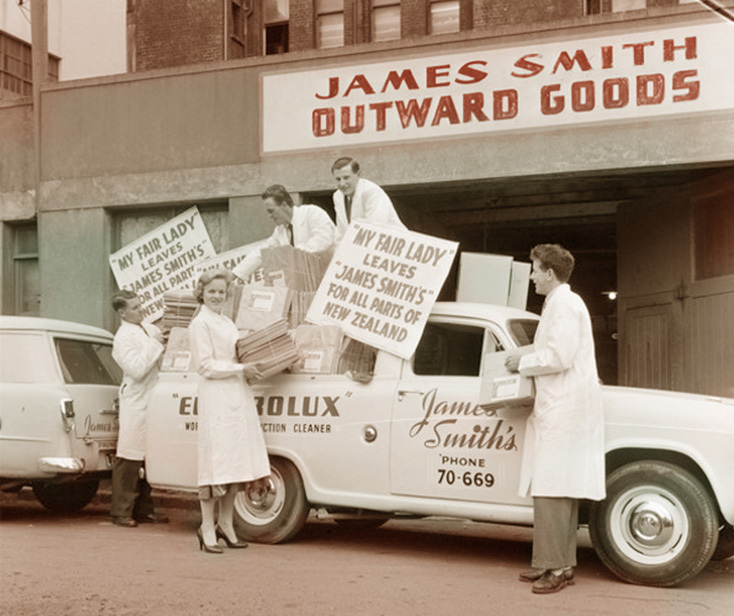 Possibly in order to improve their public image, James Smith Ltd. donated hundreds of children’s car seats to the Plunket Society in 1984 in the midst of all this disruption. In the aftermath of the sale, Summons were issued by the Financial Markets Authority to the New Zealand Stock Exchange, Doyle Paterson Brown Limited, and Australia International Ltd in enquiry into dealings in James Smith Ltd-issued securities in 1988. The display department at James Smith Ltd, hard at work on Christmas window elements. 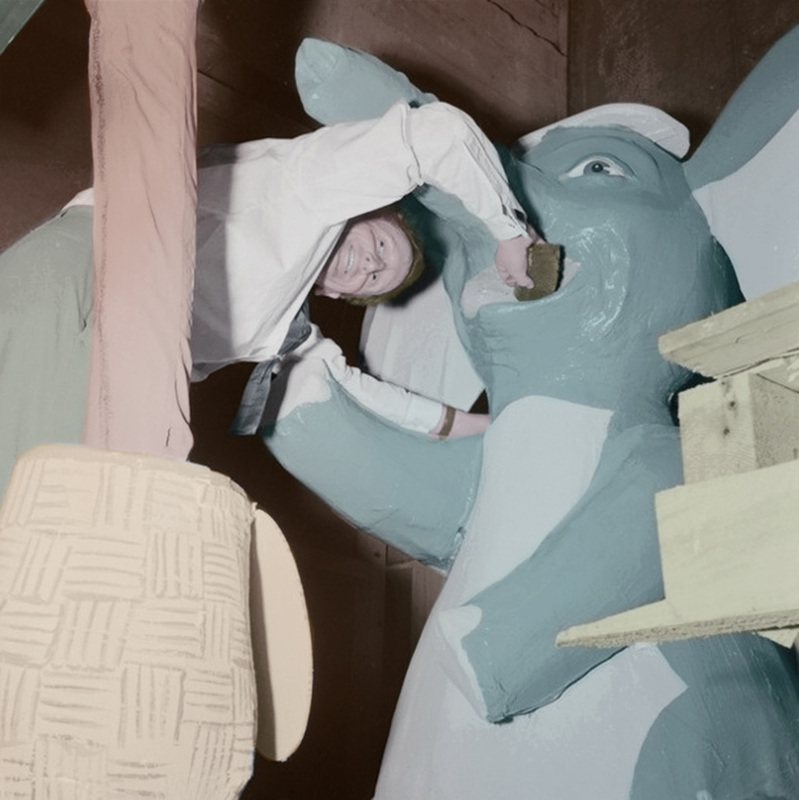 My first cousin Michael Begelman is again on the right, putting finishing touches to a papier-mâché pudding. He was also employed window dressing for D.I.C. department store in Wellington. Image by K E Niven Ltd, 1950s. Alexander Turnbull Library collection, Ref: 1/2-209976-F. Courtesy of the National Library of New Zealand. 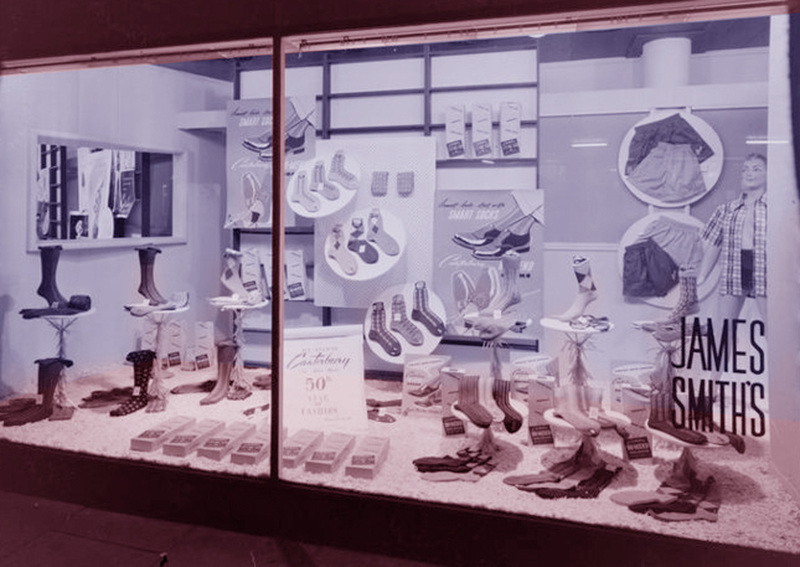 James Smith Ltd Window Display for Canterbury men’s socks, circa 1960, by K E Niven Ltd, Alexander Turnbull Library collection, Ref: 1/2-215328-F. Courtesy of the National Library of New Zealand. Into the late 1980s Geraldine Brackley recalls “I spent some concentrated time in the display department operating that horrible letter press for the sale cards, I think they thought I needed penance!” With the very old-fashioned switchboard as well as the letterpress in use late into the game , it sounds like they were lagging way behind the times in administration and work practice . It would be no surprise to learn that one of the reasons for the sale of the business may have been a downturn in profits due to inefficient management, but the legal matters on record with the government tell a story of unrest, underhanded treatments and a hostile work environment. 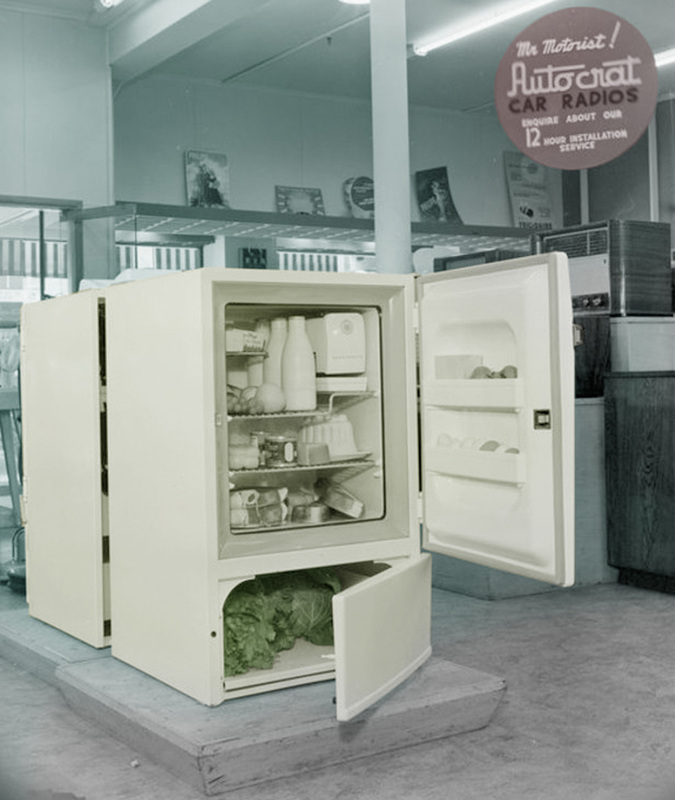 Fridge in the Whitegoods Department at James Smith’s, by K E Niven Ltd, Alexander Turnbull Library collection, Ref: 1/2-213411-F. Courtesy of the National Library of New Zealand. Various departments of James Smith’s store in Cuba Street. 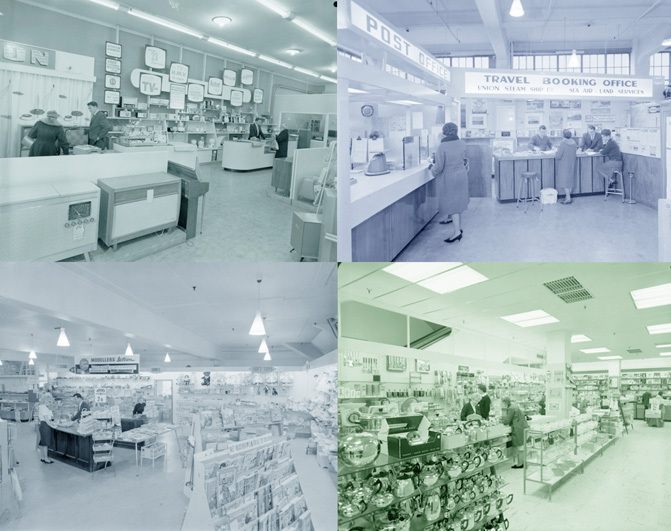 Clockwise from top left: Service TV and Appliances Ref: 1/2-213236-F, Post Office and Travel 1963 Ref: 1/2-213432-F, Kitchenware 1966 Ref: 1/2-213943-F, and Toy and Stationery 1963 Ref: 1/2-213430-F. All images by K E Niven Ltd, Alexander Turnbull Library collection, courtesy of the National Library of New Zealand. 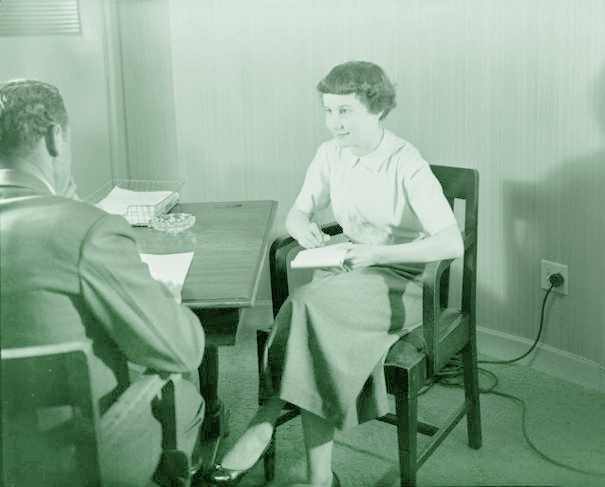 However even though more than a couple of times former staff make reference to the “awful pay” – most people seemed to have very much enjoyed their time at the company – and for the most part have good recollections of the previous two decades in particular, and even for the most part the Eighties. But how quickly things can change. The store closed for good in 1993, when L.D. Nathan passed it to Farmers’ Trading Co. Some remaining staff were transferred to Farmers’ Cuba Street and Lambton Quay. People specifically mention it “closing down” so Farmers’ clearly called it a day on the James Smith enterprise – and retained what staff they could. 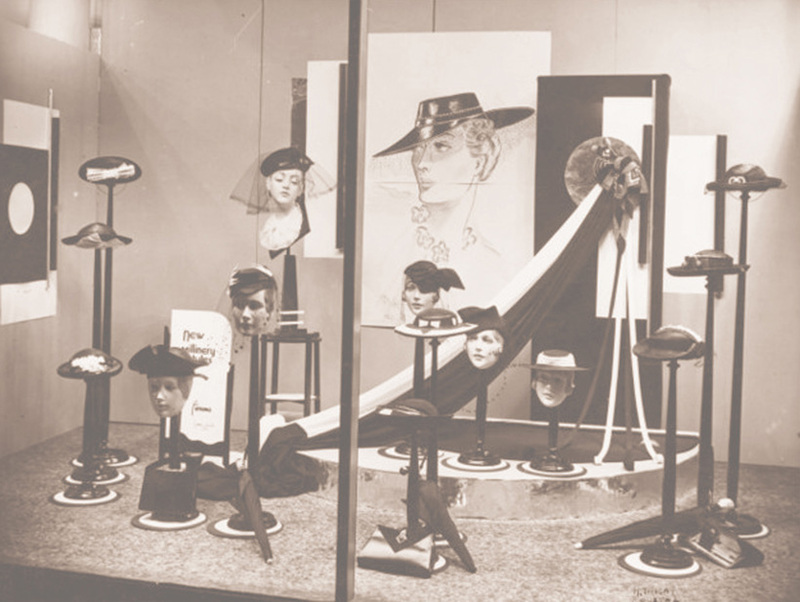 James Smith Ltd. window display of spring season hats for women, probably late 1940s. Image by K E Niven Ltd, Alexander Turnbull Library collection, Ref: 1/2-208553-F. Courtesy of the National Library of New Zealand. Various departments of James Smith’s store in Cuba Street. Top: Women’s Hat Department, Ref: 1/2-213429-F. Below:Women’s Shoe Department, Ref: 1/2-213428-F. Images by K E Niven Ltd, both taken in 1963, from the Alexander Turnbull Library collection. Courtesy of the National Library of New Zealand. 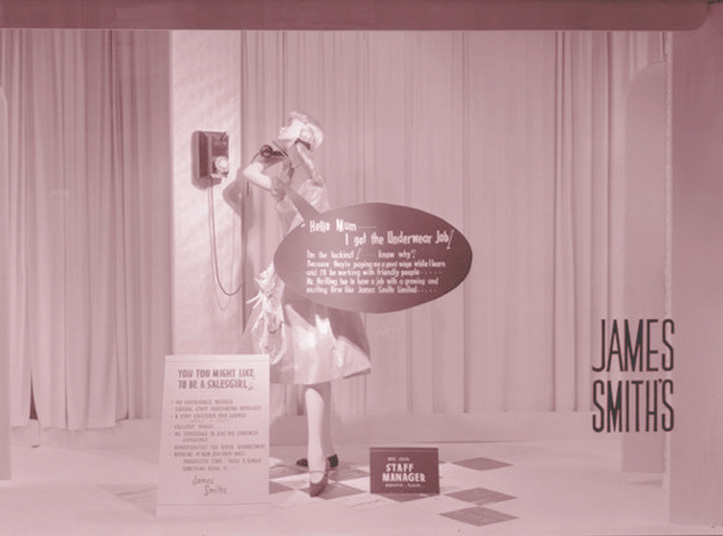 James Smith was ultimately the best known department store, in the district for over seventy years. 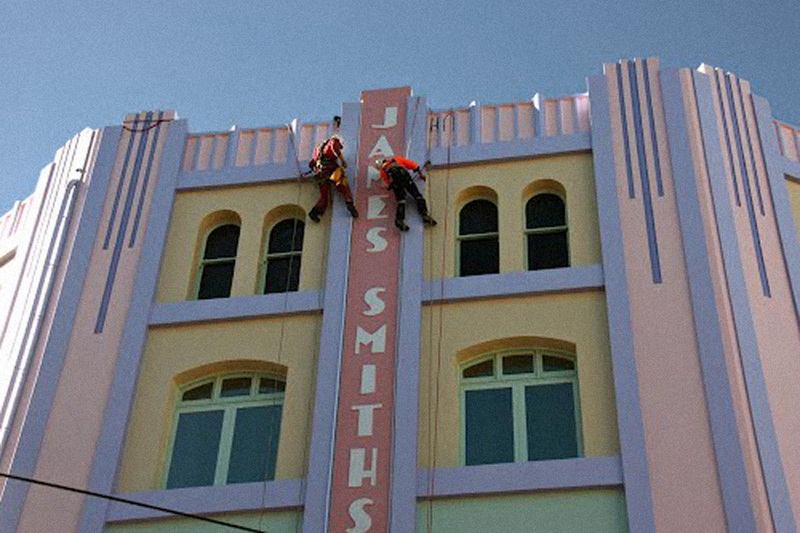 One former staffer declares that that every time she goes to Smith and Caugheys it reminds her of the James Smith stores, so given that S&C is basically the equivalent of Australia’s David Jones – James Smith Ltd must have posited themselves as quite upmarket. This led me to wondering whether there was a connection. Marianne Smith founded Smith and Caugheys in 1880 primarily in fabrics, but there seems to be no relation to James Smith excepting the coincidence of having the same surname and being in the same line of business. “I got the underwear job!” Employment opportunities with James Smith Ltd, 1960. Image by K E Niven Ltd, Alexander Turnbull Library collection, ef: 1/2-212977-F. Courtesy of the National Library of New Zealand. The new James Smith Tearooms: All images by K E Niven Ltd from the Alexander Turnbull Library collection, courtesy of the National Library of New Zealand. Clockwise from top left: Refs: 1/2-211392-F , 1/2-211398-F, 1/2-211402-F, and 1/2-211390-F.